Notes from the North: This blog series is written by Save the Redwoods League North Coast Forests Fellows. The goal of this fellowship program is to advance the League’s restoration agenda on the North Coast. Enjoy! 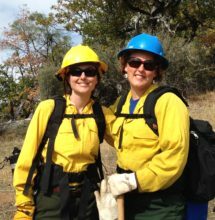 Participants in the Women-in-Fire Prescribed Fire Training Exchange (WTREX) in Northern California, 2016. When I first rolled into the Trinity County Fairgrounds in Hayfork, California, many others had already arrived, tents up and gear on, our temporary fire camp taking form. I had just arrived at the first ever Women-in-Fire Prescribed Fire Training Exchange (WTREX) (external link), and I was one of about 30 participants from around the world who would spend the next ten days learning about, sharing experiences in, and working on controlled burning, with a focus on supporting women in fire management positions. I was a sponge, ready to learn as much as possible, and I had no idea just how enriching this experience would be! Prescribed fire or controlled burning can be a safe and effective land management tool that allows for natural processes, promotes ecosystem health, and reduces wildfire risks. These fires are ‘controlled’ since they are ignited under known fuel, weather, and topography conditions, with the goal of meeting predetermined objectives. Burn plans for the WTREX locations were written well in advance and laid out specific weather prescriptions, safety protocols, and project objectives for each of the sites we would be burning during our two weeks in northern California. No time was wasted, the very next day after arriving we organized into a team spanning all levels of expertise and experience. Together, we carried out our very first effective broadcast burn. We wielded drip torches and safely ignited available fuels across the grassy woodland, held the fire lines, and gained comfort and confidence with fire. It was a rich learning environment where we could be hands on and see this natural process being reintroduced into the landscape. It felt invigorating to be a part of it. Fire has an integral role in many of California’s ecosystems both culturally and ecologically. There are many fire-adapted plant and animal communities that depend on fire to persist and thrive. I applaud the Northern California Prescribed Fire Council (external link), the Fire Learning Network (external link), and the many other sponsors who brought us all together, using fire to steward the land. Learn more about using fire as a restoration tool by reading and sharing these blog posts! Laura joined Save the Redwoods League as a Forest Fellow in 2016 after working in coast redwood and giant sequoia forests since 2008. After witnessing the many wildfires that occurred over the past summer, it’s hard not to think of them as extremely destructive. However, fires are misunderstood; they play an integral role in the unique ecosystems that California has to offer. Back by popular demand and a continued craving to make Black Friday “green,” this new holiday tradition offers everyone the opportunity to experience California’s parks and enjoy the outdoors with friends and family. To celebrate and raise awareness for these incredible outdoor spaces, we’re co-sponsoring free park passes, good for day-use admission to 116 parks throughout the state on Green Friday, November 25th.